On Friday night, Dover-Sherborn just wasn’t ready for Medfield’s defense. 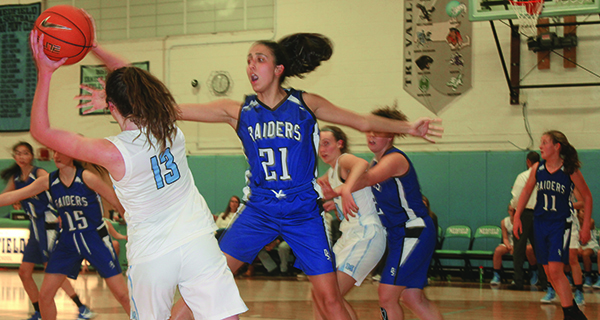 In what would end up ultimately being a 61-23 loss to the Medfield Warriors, the ladies of Dover-Sherborn seemed shell-shocked at the multi-faceted, hyper-aggressive defense they were facing. 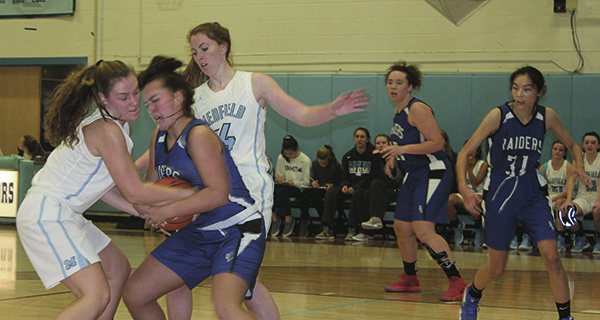 Early on in the game, Dover-Sherborn could barely get the ball over half-court with Medfield defending so strongly, and by the end of the first quarter, they trailed 11-3. Medfield went on a 16-0 run in the second quarter, based on turnovers, run-outs and the occasional three-point shot. By the time Dover-Sherborn called timeout with 4:44 left, they trailed 27-3. At that point in the game, Medfield dropped out of their press and showed another of their unique defensive strategies. No matter what defense they were playing, the aggression maintained. To their immense credit, the Dover-Sherborn girls fought hard, but couldn’t come back. With such a large lead in hand, Medfield was able to put in some of their backups and younger players for experience. For Dover-Sherborn, as tough as this loss was, there is plenty of time for them to work on some things in practice and right the ship. They certainly won’t be surprised by Medfield’s aggression next time. For Medfield, this was a nice win, but one coach Nickerson was keeping in check.